Passengers, like Valeria, depend on Metro transit to get to work, school and other important destinations. We hope you enjoy her story, and we’re interested in your transit story too. Email mrhibbard@metrostlouis.org, and we may share your story in a future “Passenger Profile. Valeria has a solution to avoid traffic – she uses MetroLink. 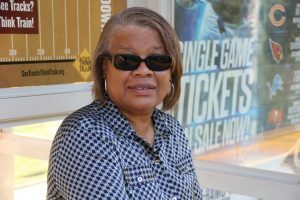 Her search for a no-traffic commute started years ago when she was driving from Illinois to downtown Clayton for work. Today, Valeria works in downtown St. Louis, and her no-traffic commute begins by boarding MetroLink at the Fairview Heights Station. She then rides the train into downtown St. Louis and exits at the Convention Center MetroLink Station. In addition to her regular work commute, Valeria has also used MetroLink to attend sporting events downtown and has even used MetroLink to get to Lambert-St. Louis International Airport. “MetroLink saves me gas and it saves me wear and tear on my car,” she said. Valeria has chosen Metro as her solution for the past eight years. “It’s so much easier to let someone else do the driving,” she said.